Tennessee Reef is a dive adventure you don't want to miss. Here the water teems with fascinating marine life including spectacular tropical fish, and colorful coral. 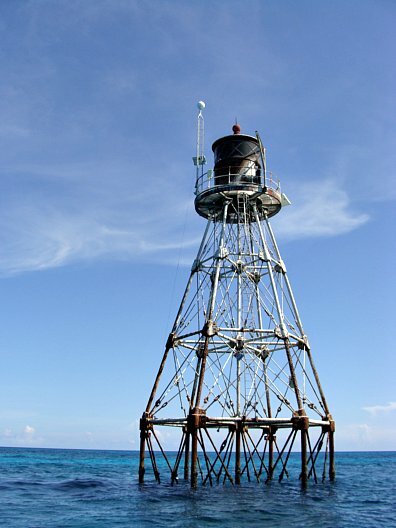 This Florida Keys National Marine Sanctuary area also has several other unusual, distinct features including it's lighthouse which stands at the southwest corner of the reef. The lighthouse was built in 1932, and is the only unmanned lighthouse that still has it's lantern. Also over the years, this reef has proven to be quite dangerous, as numerous vessels have wrecked upon it. These Florida Keys wrecks include the Virginia which foundered in 1872, the Erl King which wrecked in 1881, and the Bark Bridesmaid which hit the reef in 1889. Then in 1909, two steamships both wrecked within just a few months of each other. The Olympia foundered on March 25, and the Kelvenhead on June 14. Another unusual fact is that the area between Alligator Reef and this reef, is the longest open stretch of the Florida Keys on the Atlantic side. This natural break in the Florida coral reef has created a rather rare feature not typically seen in the Keys. That is wave action. The waves are able to build and crash on the beach, and this has resulted in beautiful lush sandy beaches at popular Long Key State Park. 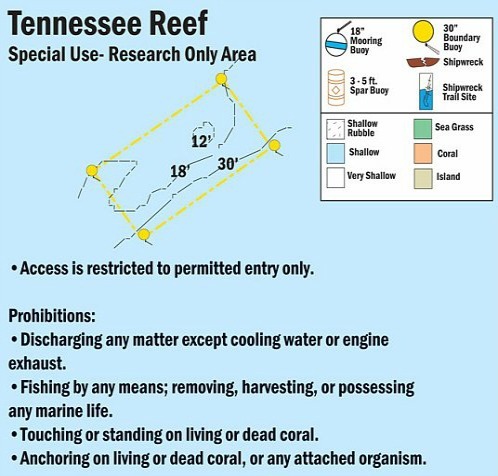 Another interesting point is that a large portion of this reef is in the Restricted Access Zone of the Florida Keys National Marine Sanctuary. The area is home to the endangered Nassau grouper along with slow growing ocean sponges and coral. This restricted area is about 2 miles east of the lighthouse, and is well identified with yellow buoys so people don't mistakenly enter the area. Anyone entering without a permit, faces severe penalties and large fines. 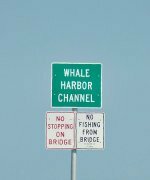 If you have a permit, the depth here will run between 12 - 30' and the area supports a good selection of Florida fish and coral. Numerous ships have wrecked here. A large portion of this spur and groove reef is only accessible via permit as it's part of the Research Only Zone. This area is well marked with yellow buoys to alert people and warn them to keep out. The Ledge is also a good place for deeper diving with an abundance of fish. It runs west of the light with a slow slope going from 30 - 50'. The Drop Off is located between the reef and the red number 18 day marker. When scuba diving Florida Keys, Tennessee Reef gives you a chance to enjoy a diving adventure that just happens to be a bit different. Not only may you luck out and get to see a rare Nassau grouper, you also have the opportunity of playing in the waves once you head back to shore to spend time at Long Key State Park. Of course if you're still up for more exploring you can always head north a bit to Alligator Reef and check out the 550+ varieties of flora and fauna before calling it another great Marathon diving day.